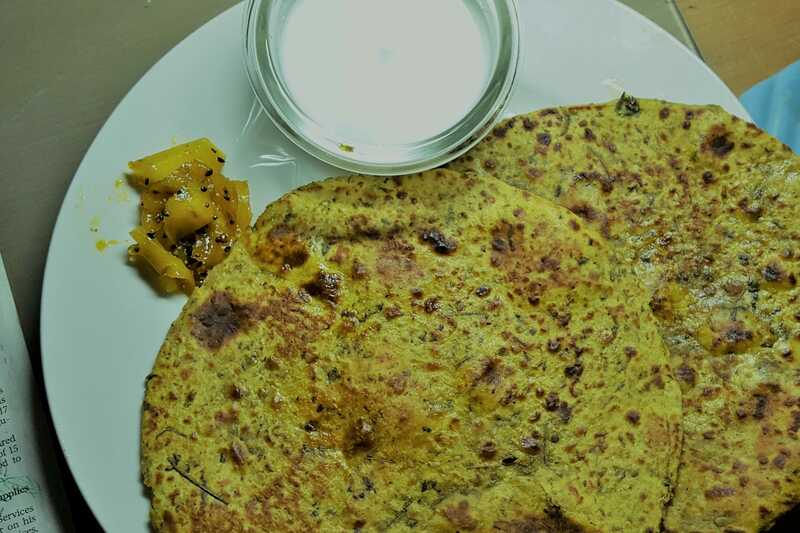 Methi Thepla is a Gujarati dish.Gujarati methi thepla preparation with fresh fenugreek leaves and the other spices. The real secret of methi thepla is a just right balance of spice and fenugreek leaves. Theplas are healthy filling and release energy slowly which is beneficial for health.These are good for breakfast. Combine all ingredients in a deep big bowl and knead into a soft dough using enough water.Leave for ten minutes. Divide the dough into equal portion and roll it into 5-6 inch diameter circle using a little whole wheat flour for rolling. Heat a Tava(griddle)and cook each circle, on a medium flame using a little oil, till it turns golden brown in color from both sides.